If the past couple of weeks is any indication of how my summer is going to go, I feel I will be contributing much more to the restaurant/happy hour review section of this blog than anything else. I’ve only made dinner once this week due to beautiful summer DC weather and friends working near me, which means we are taking advantage of every happy hour or dinner avaliable to us. This is certainly not something I am complaining about, especially since it means I have an excuse to try all of the places I’ve been meaning to go to, or, as was the case last night, to go to new places around town. locations, I have always heard wonderful things about it. 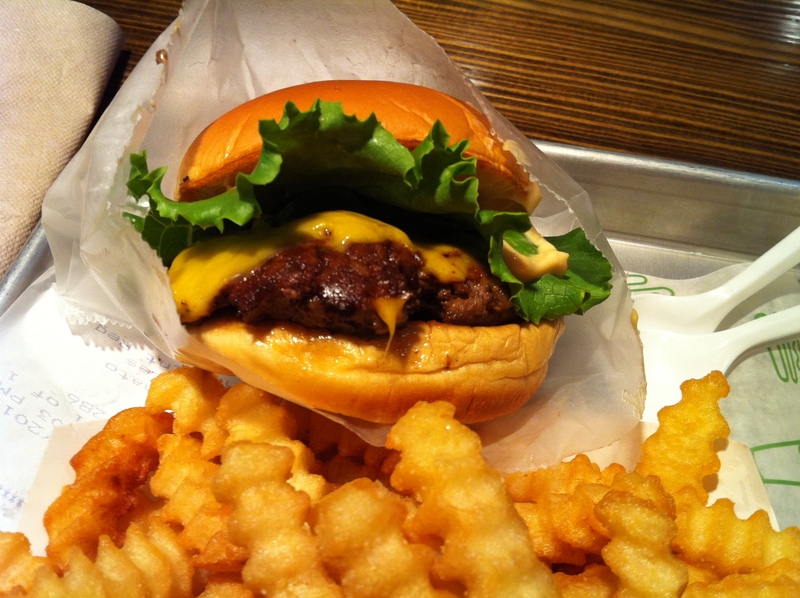 DC is a city that has many, many burger places, and more popping up every other week it seems (I also recently went to Thunder Burger in Georgetown, delicious in a more upscale burger way), but Shake Shack comes with a reputation that made it a must-try for me. Luckily, it met and even exceeded my expectations (and given that I live next door to Rays, I have high burger standards). The meat-cheese-bun-sauce ratio on the classic Shack burger was perfect, the American cheese and grilled meat melting into the much-talked-about buttered potato roll, which, I have to say, was one of the best hamburger buns I have come across. The fries were great too, crinkle cut and salted to perfection. One friend who I went with said she had found the fries overcooked the first time she got them, but credited this to the craziness and long lines of the opening week a few days earlier. I’m a big burger fan (in case you haven’t noticed I’m a pretty big fan of most food so this shouldn’t come as a surprise), and while I don’t consider myself to be a burger snob who will only eat the highest of high quality burgers, I can appreciate both a so called “gourmet” burger and a more run of the mill fast food burger. This post is a comparison of two very different but both delicious burgers, the first from Obama favorite Ray’s Hell Burger, located a convenient 5 minute walk from my apartment, the second from Fuddruckers, a much better than average fast food burger chain that I had sadly never heard of before moving to DC (on researching I found that they don’t have any locations in New York other than Albany, which basically doesn’t count). 1) Don’t eat for most of the day before. 2) If you order fries, make sure to share with at least one other person. The burgers are so filling you don’t really need them. 3) Resist the temptation of overloading your burger with more than 3 toppings. They will fall off. 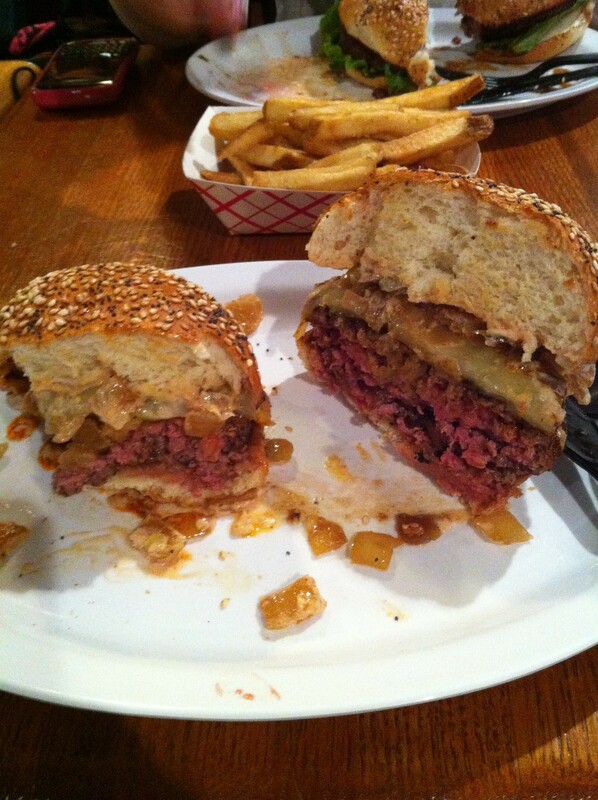 4) Cut your burger in half before attempting to eat it, it makes it much more manageable. Oh and the burgers? Yup, they’re awesome. Always perfectly cooked, seasoned, and super juicy, I can see why Obama chooses this as an introduction to the USA for foreign dignitaries. And I am very lucky that I live so nearby, as you definitely need to go more than once to sample the many toppings and the different seasonings on the burgers. Fuddruckers is a less intense burger experience, but good enough that I still go out of my way to eat at the DC location in Chinatown whenever I can. You can pick the weight of your burger, which is a useful feature, and you add all the toppings like lettuce, etc, yourself, which means it doesn’t automatically come with things you don’t want. I usually go with the 1/3 pound patty with either American or Cheddar cheese. These aren’t the monster burgers of Ray’s, which is arguably a good thing- they are thinner patties and grilled to order so they are also very fresh and well cooked. 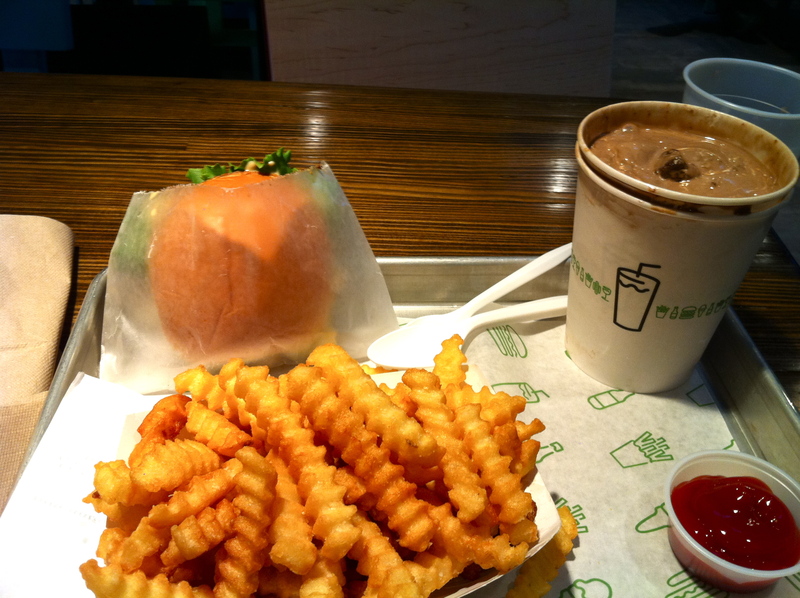 The bun is pure buttery deliciousness, and the seasoned fries are well worth getting. In a place like DC, which is home to Five Guys among many other burger spots, Fuddruckers isn’t a high-profile burger place, but it is one of my personal favorites. 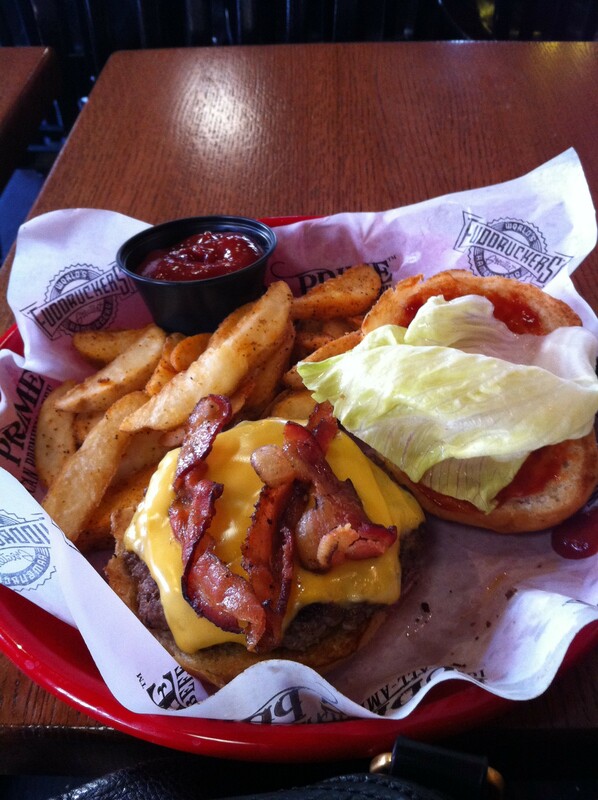 Fuddruckers and Ray’s are so different it’s hard to compare them, but if you like burgers in general these are both places to try soon. And if you go to Ray’s, please call me so I can come help eat your leftovers.